Both the monthly data and the high frequency weekly data were mixed, but with a generally bullish bias. The monthly data included a bad housing report, mediocre increases in industrial production and capacity utilization, a decent but not outstanding LEI, an mixed Empire State index, and a strongly positive Philly manufacturing index. The BLS reported new jobless claims remained the same as last week on an SA basis at 505,000. On a 4 week average basis, this series continues to decline. U.S. new-vehicle sales are expected to rise in November from a year earlier, adjusted for two fewer sales days this year .... [C]ar sales are seen rising 3.8% in the U.S. from a year ago. Without the adjustment for there being 23 selling days this year and 25 last year, the auto Web site's estimate is 4.5% below last year's sales and down 15% from October...."
The overall annualized sales rate in November is projected to be 10.3 million, down slightly from October's 10.43 million rate. as strong as up 5 to 8 percent. ShopperTrak an increase of 0.7% in mall retail sales compared with a year ago, and also up 7.5% from the previous week. Rail traffic continued to improve -- not just in a relative sense to last year, but in an absolute sense as well. This is bullish. Last week commenter Olephart correctly observed that I had posted a graph which didn't really make my point. Cyclical traffic frequently starts to decline in October, but sometimes not until now. As of mid-November, it is not just flat, but actually turned up last week. The Daily Treasury Statement as of November 18 showed $85.8 Million in withholding taxes paid month-to-date, compared with $86.7 Million last year. For the last week, this year's totals have been generally equal to or slightly ahead of last year's. Since this data series tends to lag the end of recessions by one quarter, this may be the month it finally turns. Oil retreated from its flirtation with $80, as of midday Friday trading at $76.50. In September, (1) through (4) had apparently already happened. Number (5) is all about the strength of the turns. Based on the strength of the Leading Economic Indicators, I concluded with a prediction that payrolls would most likely hit bottom and turn around in November or December, +/- 1 month. Two months later, how is that playing out? A major revision in data calls into question one large element of the analysis. There are three very positive developments, and three negative or flat. Details below. In the first installment of the series, I looked at initial jobless claims. I noted that (1) in those recessions and recoveries where jobless claims fell steeply, peak unemployment occurred within 2 months of the point where jobless claims fell 12% from the peak; but (2) in those recessions and recoveries where jobless claims fell slowly, peak unemployment occurred not at the 12% mark, but only when new jobless claims were more than 16% less than peak claims, and stayed more than 16% off for at least 3 months thereafter. In the last month, our recession/recovery has become more comparable to the 1982-3 recovery than previously. As you can see, in the two "jobless recoveries," new jobless claims failed to penetrate the 20% off level except for a brief instance in summer 2002 (coinciding with a brief positive jobs number). Should the present trend continue this indicator predicts actual job growth this month or next. [Note: In this regard I am at odds with such esteemed luminaries as Berkeley Prof. Brad DeLong and Calculated Risk, who believe that jobless claims must fall all the way to 400,000 before jobs will actually be added, based on the last two "jobless recoveries." I disagree, based on the recoveries from the deep 1970s and 1980s recessions. All I can say is that the data is already not behaving in accord with their analysis. Nevertheless, I would be glad to be proven wrong provided it occurs quickly!]. I next looked at the ISM Manufacturing Index, and concluded that the 53 level (50 is the dividing line between expansion and contraction) is the point where jobs began to be added in the very strong recovery after 1982, as well as during the week recoveries of 1992 and 2002. Further, a reading over 54 on the index has always coincided with actual job growth. Additionally, whenever the hiring vs. firing sub-index was -5 or higher (i.e., no more than 5% more employers plan to fire than hire) and rising, where other evidence indicates a recession is ending, that has always indicated net employment growth was imminent, at least on a temproary basis; and also, whenever current staffing intentions were 65+. and hiring plans were 15+, that has always coincided with positive jobs numbers in the BLS survey, including during and after the "jobless recoveries" of 1992 and 2002. Despite this indication of actual net hiring in the manufacturing sector, the October BLS jobs data claimed 61,000 job losses in manufacturing -- the most in four months! -- and 190,000 total job losses. Everybody knows that the BLS significantly revises their initial numbers, and I suspect the report of job losses in manufacturing is going to be substantially revised. In part 3 of the series I noted that industrial production tends to peak a median +2 months before payrolls, and to trough at the end of recessions a median +1 month before payrolls. Of the 10 troughs since World War 2, in 8 of them industrial production troughed within 2 months of the payrolls number. Further, the only times that industrial production has led employment growth by a relatively long period of time, it has also shown weak growth -- less than 5% a year. In more typical V shaped job recoveries, it has grown at a rate of 10% or more a year. This, like the trend of initial jobless claims, is at levels consistent with actual job growth this month or next. As of October, this index has stalled at just above 50, and the employment subindex fell to 41.1 (meaning substantial layoffs). Based on this sparse record, one would have to say that the prospects of job growth in any services sector in the next few months look remote, at best. This suggests that, while 3rd quarter GDP was initially reported up at an annual rate of 3.5%, which surprised most people (it may be revised downward somewhat due to increased imports), at least two more quarters of such growth must take place for YoY GDP to reach +2%. The Leading Economic Indicators at this point do indicate positive GDP growth in the 4th quarter, carrying over at least into part of the first quarter of 2010, but after that, the jury is out -- especially with $80 Oil. A major revision of recent data by the Census Bureau calls this element of my analysis into question. I described real retail sales as the Holy Grail of Leading Indicators for job growth, noting that his consistently turned at both tops and bottoms, an average of 3-5 months before job growth or losses turned. When real retail sales stay flat, they generate a lot of noise, and a longer period between the turn in sales and payrolls. Strong turns in sales generate reliable subsequent moves in payrolls in subsequent months. In general, with regard to recoveries, an increase of about +2.5% a year is necessary to reliably generate a subsequent move in real retail sales. On a three month smoothed average basis, real retail sales bottomed in April of this year. Despite October's growth of 1.4%, nasty revisions downward of August and Septmber totaling -1.3% mean that real retail sales are up only about 0.9% off that low, for an annual rate of 1.7%. In short, the revisions keep real retail sales within the range of "noise." The past few months may be the beginning of a solid upward trend, or continued revisions may mean the series stays flat with no growth whatsoever. This is simply not consistent with job growth yet. John Maynard Keynes famously justified a change in opinion by saying, "When the facts change, I change my opinion. What do you do?" Well, a critical fact in my analysis has changed. Three indicators -- ISM manufacturing, Initial Jobless Claims, and Industrial Production -- are now at levels typically associated with actual job growth in previous recoveries. All three of these series exceed their growth in the two "jobless recoveries" of 1992-3 and 2002-3. The "Holy Grail," however, Real retail sales, is only trending sideways or slightly higher albeit for unique reasons (cash for clunkers). The substantial downward revisions in real retail sales in August and September call into question when the overall jobs number will turn. While industrial production is indeed having a "V" shaped recovery so far, growing at a rate similar to 1983; by contrast, Real retail sales' anemic growth is similar to -- and even weaker than -- its pattern in the last "jobless recovery," below the 3% annual growth typically associated with job growth. The services sector is stagnated with continuing substantial job losses, and GDP growth, while impressive, isn't impressive enough to think that jobs will actually turn positive by year's end. At the end of the day, the Leading Economic Indicators either work or they don't. If they work, then the coincident indictors of real income, real retail sales, and employment must start to trend upward shortly. What may be developing is a bifurcated economic expansion, in which jobs in manufacturing are added back quickly (hence, not a "jobless recovery") but services continue to shed jobs as consumers continue to repair their balance sheets and shop discerningly for bargains (thus a "job loss recovery"). This tends to move the turning point for jobs into January-March (January at least being consistent with my original prediction). Finally, as I said in my concluding installment in September and have reiterated since: let me be the first to acknowledge that this is not a scientific truth or certainty, but a best estimate based on a logical review of existing data with a long history that accommodates both traditional and "jobless" recoveries. Invictus has a piece just below where he highlights a fairly typical event: a public figure making up facts as they go along. Unfortunately, this is more and more of a regular event. At first I found this existed on the right side of the political aisle. The reality is extremely conservative economic doctrine -- the whole "let the market work it out" argument -- just doesn't work as planned. The basic problem is any system needs rules to survive and prosper along with referees. Imagine a sporting event without a ref. No one would go because eventually it would break down into a fight. In addition, we need rules to create a structure. That's just the way things work. But we're also seeing this more and more on the left side of the political aisle. As the recovery has continued -- as the data has turned more and more positive -- there are more and more allegations that the data is rigged -- at least the data that is positive. People go on to quote negative data as if it is gospel. And economists are ignorant bastards -- until they're bearish. Then they are to be trusted completely. In other words, people on the left are now guilty of what they accused the Republicans of -- making up facts to fit a preconceived world view. What we are seeing more and more is the existence of multiple realities where people can find "facts" to fit their view. Think tanks on both sides of the aisle are happy to spin in any direction. The problem is no one is living in reality. Anything that conforms to their world view is golden; anything that doesn't conform to their world view is corrupt. And as a result of all of this, we're not going to get anywhere. We're still seeing an incredibly bearish overall trend in place. Note that we are still seeing a trend of lower highs (A) and lower lows (B). Also note the bearish orientation of the EMAs (D) -- all are moving lower and the shorter are below the longer. 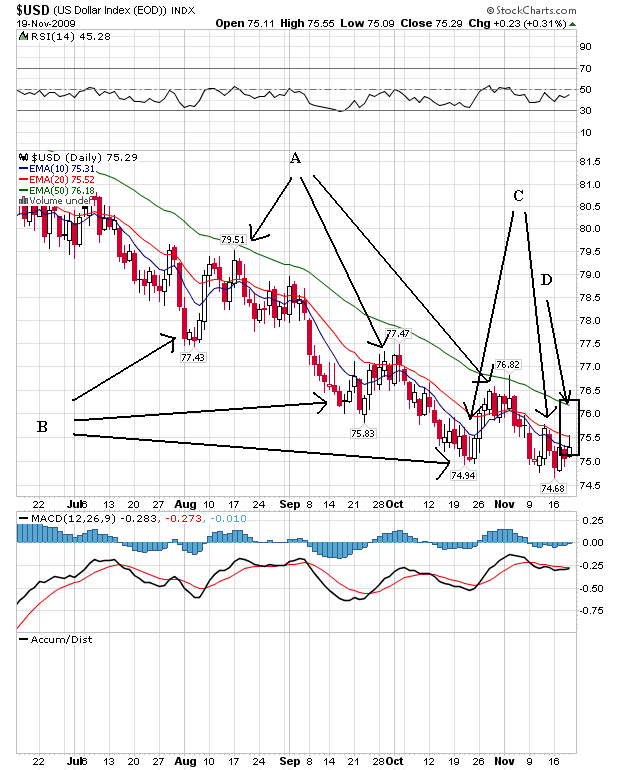 However, there is still the possibility of a double bottom emerging (C). Note the momentum increased on the second bottom and the RSI printed a higher total. Fundamentally, it's still very difficult to see what the catalyst for a rebounding dollar would be. The US is printing tons of debt and our overall interest rates are still very low. While we have printed a stronger GDP, the economy is still on shaky ground. During Tim Geithner's somewhat contentious appearance before Congress today, some Republicans took every opportunity to get their shots in. Congressman Michael Burgess (Asshat-TX), was no exception. He got his sound bite in -- "I don't think you should be fired, I think you never should have been hired," or something to that effect. Whatever, he's entitled to his opinions, but not his own facts. Watch it here at 3:57 into the video. Business as usual: Just make stuff up. P.S. Congressman, if you're out there, just drop your response in the comments section. I've spent a fair amount of time explaining why I don't like the current market. This is another post along those lines. A.) On November 9 prices gapped higher, printing a strong bar. That's the kind of event bulls like. B.) The prices clustered in a very narrow range, printing three very weak candles. This is a terrible way to follow-through from a strong up day. C.) Prices can't gtet above the 111 level in a meaningful way. They try but just can't get above the level with any momentum. This is followed by today's action which was a sell-off. The EMA picture is still bullish. 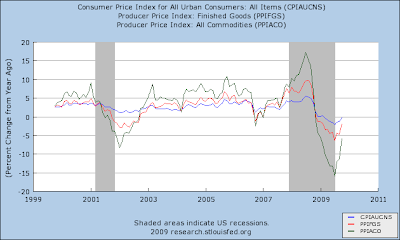 But notice that prices just aren't moving higher with any conviction. Combine with with the weak performance by the Tranports and microcaps and I'm just not impressed. Privately-owned housing starts in October were at a seasonally adjusted annual rate of 529,000. This is 10.6 percent (±8.7%) below the revised September estimate of 592,000 and is 30.7 percent (±8.3%) below the October 2008 rate of 763,000. Total starts have been in a roughly 100,000 unit range for 10 months. Right now, it looks like we're bottoming. As I predicted a couple of weeks ago, October Leading Economic Indicators (and revisions to September) came in at +0.3, the seventh positive reading in a row. This suggests that economic growth will continue through this quarter and the first quarter of 2010 as well. To repeat what I said then: typically, even in the last two "jobless recoveries", jobs began to be added to the economy when the YoY LEI was up +5% or better. This month will replace the awful -1% of October 2008, meaning that for the last 7 months, the LEI is up 5.9%, and up 4.2% YoY. If the LEI simply print flat for November and December, the YoY growth will be +5.0%, consistent with jobs being added in December or January. In view of this week's poor housing permits number, that should prove interesting. 3) There are no new eras -- excesses are never permanent. 8) Bear markets have three stages -- sharp down, reflexive rebound, and a drawn-out fundamental downtrend. 9) When all the experts and forecasts agree -- something else is going to happen. Print them out and keep them handy. You'll be glad you did. The BLS reported that for the week ending Nov. 14, seasonally adjusted initial jobless claims were 505,000. Last week's number was revised slightly higher to 505,000 as well. "The 4-week moving average was 514,000, a decrease of 6,500 from the previous week's revised average of 520,500." Unadjusted, there were 479,295 new claims, a decrease of 53,132 from the week before, and well below the 513,000 initial claims in the same week last year. In unadjusted terms, this was the best new claims number, relative to normal seasonal adjustment, in over a year. The 4 week moving average is now about 21% lower than the peak of 658,750 on April 3 of this year. Needless to say, the continuing decline in the number of new claims bodes well for the jobs outlook. B.) The EMA picture is still bullish -- the shorter EMAs are above the longer EMAs. But also notice the 10 day EMA is more or less horizontal, indicating a flat line short term trend. The longer terms trends (20 and 50 day EMAs) are still positive. Finally, note that on several times over the last few weeks prices have used the 200 day EMA as technical support. A.) Momentum is decreasing but not crashing. This is standard in a consolidation pattern. B.) The A/D line is still positive, indicating we have not seen a huge outflow of money from the market. B.) There is low volume. If people are so excited about this market then they should be stampeding into the market, thereby increasing volume. And if the market is so strong, why aren't the Transports confirming the rally? A.) Or the microcaps -- which are still hitting resistance at the EMAs. This is not a broad rally which is very disconcerting. With Congressional Democrats in near-panic amid forecasts that unemployment will remain high through next November’s midterm elections, a party leader said on Thursday that the House will pass a new “jobs bill” before Dec. 18. Senate Democrats likewise are weighing options. And the signals from Congress follow by a day the White House’s announcement that President Obama will follow his “Forum on Jobs and Economic Growth” on Dec. 3 with a “Main Street Tour” starting the next day in Allentown, Pa., and continuing to other hard-hit places in coming months. With more than half of last winter’s $787 billion package of tax cuts and stimulus spending still in the pipeline, Representative Steny H. Hoyer, the Democratic majority leader from Maryland, said the new measure should not be called another stimulus bill. He indicated that the legislation might include money for public jobs, which many liberals have advocated; tax credits to employers for new hires, an Obama campaign proposal that was shelved early this year amid concern that businesses might game their payrolls; and additional spending for infrastructure and road projects. First, this is an overall good idea. With unemployment at 10.2% every little bit helps. But it's also important to remember exactly what has happened in the economy and where we are in the cycle to understand exactly what is going on. And no -- the following is not an endorsement of bad times; it is simply an explanation of the facts without a judgment attached. At the end of last year and the beginning of this year the US was losing jobs at a rate of 600,000/month. That lasted for 5 months. Or to put it another way, the US lost 3 million jobs in 5 months. That is almost half of all the jobs created during the last expansion. That tells us the severity of the economic situation was indeed severe. Employers simply cut everybody they could and then some. In addition, we have also learned that the BLS has added an additional 800,000 jobs losses to the official job loss total. These will be added in February. This further indicates we were in an extremely severe economic contraction. Currently the economy is back from the brink. We printed a solid GDP number last quarter and the rate of job losses continues to decrease. In addition, the pace of initial unemployment claims continues to move lower. All of these facts tell us we're moving in the right direction. BUT -- and this is very important -- remember where we were last year at this time. There were a lot of people talking about depressions and deflationary spirals. These are the most severe economic events we can experience. The repercussions of these events last a long time. Does this statement imply that I am unsympathetic to the unemployed? No. I have never advocated (and will never advocate) that we decrease or cut off unemployment benefits or show any less sympathy for those who have lost their jobs. That is not the point of the above recitation of historical facts. The point is things are moving in the right direction. Recoveries -- especially from near financial collapses -- don't happen overnight. As the article states we've only just started to use the stimulus money. We've just printed our first quarter of positive GDP growth. By this time next year things should be better. This morning's CPI came it at +0.3%, slightly higher than estimates. YoY CPI is -0.2%. This is undoubtedly the swan song for deflation this year. 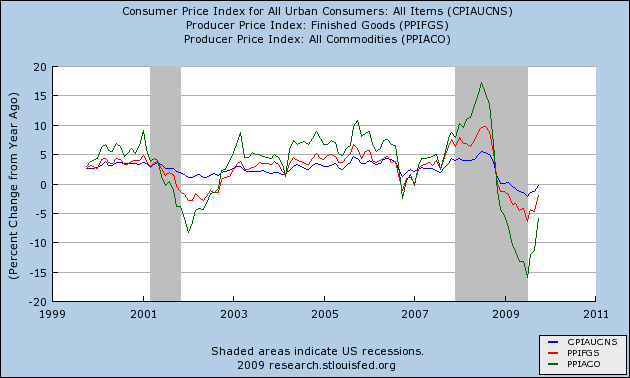 Almost certainly we will find that this month prices increased about 2.0% YoY. When all three are rising, green more than red more than blue, that's bad and almost always triggers a recession (always in the presence of an inverted yield curve 1 year previously). That's because price pressures in crude goods can't be passed on to producers, who in turn can't turn them on to consumers, so there are cutbacks, triggering a recession. All three then proceed to fall, as demand slackens. As I have repeastedly noted, this was also true of the Great Depression and the 1920's booms and busts. In short, the K.I.S.S. signal -- a positive yield curve, a rising rate of price changes, and cpi exceeding ppi -- together with the positive LEI of the last few months, indicate the economy will show growth for the 4th quarter. A.) Prices consolidated in a triangle pattern from roughly mid-October to mid-November. B.) Prices moved out of this price range by gapping higher and printing a very strong candle. Also notice the volume surge that took place. Also note that prices are still above the long-term trend line. Finally, we still have a very bullish EMA orientation -- the shorter EMAs are above the longer EMAs, all the EMAs are moving higher and prices are above all the EMAs. A.) Like copper, agricultural commodities formed a triangle consolidation pattern from roughly mid-October to mid-November. B.) Price broke out of this pattern yesterday by printing a strong bar on high volume. The EMA picture is a bit more muddled. Prices have been coalescing around the 200 day EMA and the shorter EMAs are below the 200 day EMA. In addition, notice the EMAs are in a tight range. Ideally in a bull market we'd like to see a more bullish orientation for the EMAs. A.) 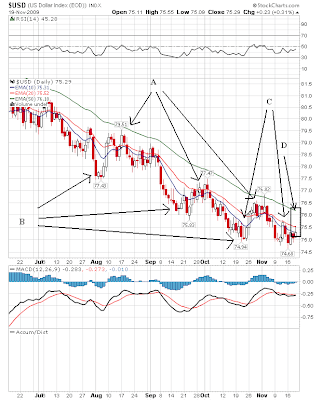 The QQQQs may be forming a broadening top formation. B.) but the EMA picture is still very strong -- the shorter EMAs are above the longer EMAs, all the EMAs are rising and prices are above all the EMAs. E.) If we're really topping out, why aren't we seeing money flow out of the market? Instead, we're seeing the A/D line hold steady. The Empire State Manufacturing Survey indicates that conditions for New York manufacturers improved in November, but at a somewhat slower pace than in October. The general business conditions index fell 11 points, to 23.5. The indexes for new orders and shipments posted similar declines. Pricing pressures eased, with the prices paid index positive but lower than last month and the prices received index rising to a level just below zero. Employment indexes fell from October’s elevated levels, remaining slightly positive. Future indexes conveyed an expectation that activity and employment would improve in the months ahead and that both input and selling prices would increase significantly. Notice the overall trend for both overall business and new orders is positive. Also note the employment component of the report is also getting better. The U.S. Census Bureau announced today that advance estimates of U.S. retail and food services sales for October, adjusted for seasonal variation and holiday and trading-day differences, but not for price changes, were $347.5 billion, an increase of 1.4 percent (±0.5%) from the previous month, but 1.7 percent (±0.5%) below October 2008. Total sales for the August through October 2009 period were up 1.5 percent (±0.3%) from the same period a year ago. The August to September 2009 percent change was revised from -1.5 percent (±0.5%) to -2.3 percent (±0.3%). Excluding the 7.4% increase in auto sales, retail sales rose 0.2% in October, the data showed. Sales excluding autos have risen for three months in a row and in five of the past six months. Simply put, sales are moving in the right direction. Also note the alot of the increase was car sales - in a post cash for clunkers world. That tells us there is still demand for autos out there without government stimulus. B.) The recovery where the pace of month over month percentage changes returned to more normal levels. That appears to be where we are now. Short version, both of these pieces of data are positive. The release of October retail sales yesterday and industrial production this morning make for interesting bookends to the economic situation. This morning Industrial Production for October was reported up a mere 0.1%. Capacity utilization was reported up 0.2%. I tend to ignore the latter number, since it generally tracks the former, and capacity utilization has been in decline literally for decades, reflecting America’s relative industrial decline. Industrial production, however, is an excellent coincident indicator for industrial growth or weakness. Whether October's meager increase means a slowing down of the trend of expansion, or is just one month's noise, is impossible to tell. In any event, this means that since its bottom at the end of the second quarter, industrial production has grown 2.9% in four months (or about 12% a year), which is the best rebound from a recession trough since 1982. In other words, so far manufacturing is having a V-shaped recovery. On the other hand, while yesterday’s retail sales figures appeared great at first blush, up +1.4% from September and topping estimates substantially, the downside was the very nasty revisions to August and September. August was revised down from +2.7 to +2.2. September was revised down from -1.5 to -2.3. In other words, those two months together went from +1.2 to -0.1. The efficacy of “cash-for-clunkers” as anything other than a momentary blip appears to have been entirely revised away. Ouch! Thus September may have actually made a new low in real retail sales for the recession. Over the longer term, since April, real retail will be about +0.8 instead of +2.0 as it may have otherwise appeared. The services economy isn’t having a V-shaped recovery; in fact it is barely having a recovery at all. The above contrast fits perfectly with the ISM manufacturing and non-manufacturing data. Manufacturing moved into expansion first, and is already expanding faster than it has coming out either post-1982 recession. Non-manufacturing, however, is barely expanding at all. Employment in manufacturing has already started to increase, according to the ISM manufacturing report, but employment in services is continuing to fall, and actually fell off at a worse rate last month. This analysis also seems to dovetail well with Invictus’ take on the divergence between large vs. small employers. I’ll have more to say about this divergence in an extended post in a couple of days. So we have two bookends for the economy: industrial expansion, services stagnation. The recovery from the recession is all about selling goods to foreign consumers, chiefly Asians, whose standard of living is improving. On the other hand, the American consumer is no longer the engine of global growth, but the caboose. His/her standard of living is in decline, and will only turn around when the structural forces which led to that decline have been abated. One final note: the October growth in retail sales was not surprising, if you’ve been following my “Weekly Indicators” each Friday. 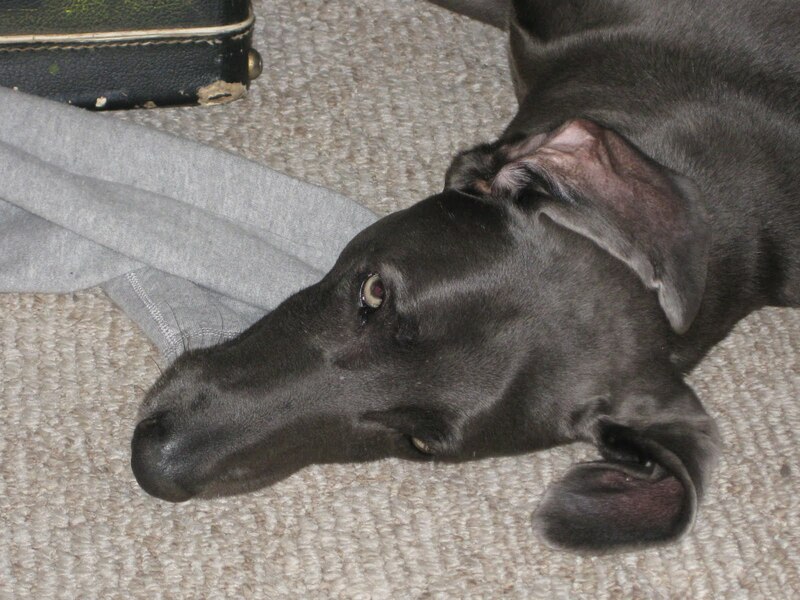 I have been tracking these items precisely because they give high volume real-time information. So when automakers reported sales up 10% from September to October, and when the ICSC reported ever-improving week over week sales followed by good monthly same store sales for October, it appeared likely that the retail sales number would oblige, and it did. Could Unemployment Breach 12%? 13%? Economist David Rosenberg made some news last week on Bloomberg's Surveillance when he speculated that the unemployment rate in the United States could hit between 12 - 13%, higher than most economists are currently projecting and clearly an outlier forecast. I'm not entirely sure why the call is apparently so controversial. The average difference between the two is just over 4%; it's currently a record 7.3% (17.5 - 10.2). (U-6 is only available since 1994.) Now, we can get back to the long-term average many ways, but it's certainly not out of the realm of possibility that one way we'll do so is to see unemployment at 12% while the U-6 drifts back down toward 16%. Would anyone consider that possibility crazy? Firms with fewer than 500 employees accounted for 64 percent (or 14.5 million) of the 22.5 million net new jobs (gains minus losses) between 1993 and the third quarter of 2008. This is the group that, according to the NFIB's monthly SBET [.pdf], is simply not seeing much light at the end of the tunnel. So the question needs to be asked: When the NFIB reports that the country's "job generating machine is still in reverse," and we know that its member firms account for ~64% of net new job creation, how are we going to achieve sufficient job creation to make a meaningful dent in the un- and under- employment rates before Rosie's forecast comes to pass? So, hiring plans for small business are, in fact, incrementally worse now than they were one year ago (-1 vs. 0). There's no more inclination on the part of this business cohort to add employees now than there was one year ago, and in that period the unemployment rate has increased dramatically. Makes Rosie's forecast seem fairly uncontroversial to me. All charts are of the IEF -- the 7-10 year Treasury ETF. Click on all charts for a larger image. In general, the IEFs were in a downward sloping flag pattern for the last ~month. Also notice the lack of overall firm direction over the last 6 months; there is no firm trend in either direction. Instead there are really four moves: up, down, up then down. This tells us there is no overall trend in place. A.) Prices broke through the downward sloping trend line and the 200 day EMA. B.) Note the reversal in the EMAs -- all have turned upward. While the orientation of all three is still negative -- that is, the smaller is still below the longer etc... -- the movement is bullish. Also note that prices are above the EMAs which will contribute to this trend continuing. B.) The accumulation/distribution line has been moving upward for the last 4 months. That tells us that despite the lack of overall direction, the overall tendency has been for people to accumulate Treasury's. That's especially interesting considering the stock market has rallied strongly over that period and the Treasury is issuing boatloads of debt. In other words, there is still a strong, fundamental long-term demand for Treasuries right now. A.) Prices opened with a gap higher on good volume. C.) Prices broke through support and had increasing volume on the sell-off. D.) Prices found support at the 200 day EMA. Ideally, we'd like to see prices hold levels into the close as a sign of strength. When we see sell-off from gains on an intra-day basis it says traders are skittish about keeping positions overnight. It's getting so tiresome to read about how the increases in minimum wage are the direct cause of skyrocketing teen unemployment. See here, here, and here for just three stories on the subject. Now, what I see in this chart is that teen unemployment -- like most unemployment in general -- is much more highly correlated to recessionary periods in the economy than it is to the minimum wage. But that's just me. 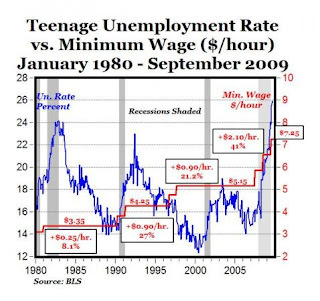 Honestly, I just can't look at that chart and seriously argue that there's a cause/effect relationship between minimum wage and teen unemployment. But we live in an age where arguments gain traction on the skimpiest of evidence (sometimes even none whatsoever -- see: the 1977 CRA caused the near economic collapse of 2008 -- a time bomb with a 30 year fuse!!!). Allow me to make another argument, one that I think makes much more sense. I first made this argument over at Blah3, and I'll make it again here with some updated charts. What I suspect is fairly simple: That simple demographics coupled with the damage wrought by this recession on the Baby Boom generation -- in terms of both real estate and investment portfolios (particularly retirement portfolios) -- is so great that many Boomers have realized they're going to have to postpone retirement (see one story on that here, there are thousands on "postponing retirement" out there on The Google). Gee, what do you know -- this ratio has been on the increase since about the turn of the century, the exact time the first of the Boomers were turning...55. 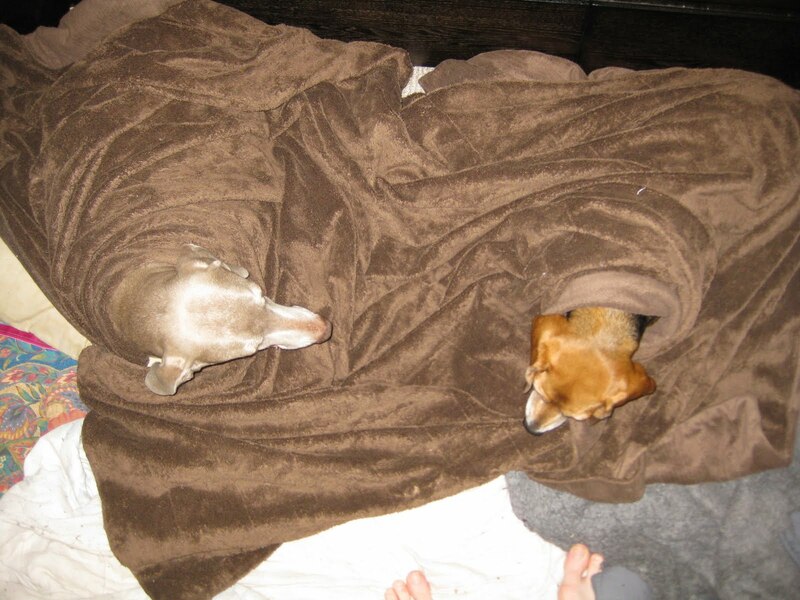 Whaddya know, they're staying in the workforce and, arguably, crowding their own kids out of it. There are now over 6 55+ employees in the workforce for every teen -- a record that shows little sign of letting up. 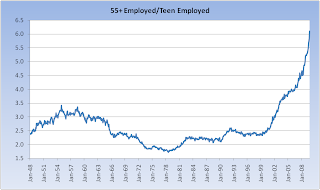 Second, let's look at the 55+ and Teen cohorts as a percent of the Employed Workforce. Again, what we see is that the older generation is crowding out the younger generation in a trend that well predates the recent set of minimum wage hikes we've seen. Look at the two charts I've presented versus the absurdity at the top and ask yourself, which argument makes more sense? Which argument does the data seem to support? In short, the minimum wage canard is yet another feeble political attempt to lay the economy's woes at the feet of Democrats. It's shameful, really, but not at all out of character. I expect I'll be revisiting this issue with each passing NFP print. Waste of time, but somebody's got to do it. What I suspect will happen in 2016, sadly, is that those with a political agenda will look at the numbers and claim the disparity is being caused by -- you guessed it -- minimum wage hikes that ocurred eight years prior. Large vs. Small Business Decoupling Story Gaining Traction? We noticed an interesting piece of research on U.S. GDP from Goldman Sachs’ Economics team that’s worth highlighting. The team questions whether the official government GDP statistics capture how poorly small businesses (ie, sole proprietorships) are doing. The weakness in small business sentiment is seemingly at odds with the recent 3.5% Q3 GDP reading but may explain why the unemployment rate has continued to steadily increase. Part of the reason for small business weakness is that most don’t have the same access to credit as larger firms and larger firms’ output tends to be better captured in the GDP data. While sole proprietorships tend to be small they collectively account for a nontrivial 17% of the U.S. economy. The Goldman team uses a couple of different statistical approaches to test their thesis. They use timely data from the National Federation of Independent Business (NFIB) confidence survey, which shows that despite a recent improvement, confidence remains exceptionally weak (in fact two standard deviations below long-run trends). The first model suggests that the NFIB survey is consistent with overall GDP growth of 2.5% to 3.0% — not the 3.5% reported. As well, they find that current NFIB readings are more in line with below-50 readings on the ISM manufacturing index versus the actual reading of 55.7. The second approach has to do with revisions to the GDP data and their relationship to the NFIB. U.S. GDP goes through many revisions as more, and better, information becomes available with lags — historically preliminary numbers are revised down by almost 0.5 percentage point. This second model suggests that Q3 GDP could be revised down by as much a 1-2 percentage points. I've been trying to get my hands on the Goldman piece to read it for myself, but as yet have been unable to source it. In any event, it would appear that the decoupling story of large vs. small business is, perhaps, beginning to gain some traction. As a new and semi-permanent era of frugality dawns and consumers increasingly gravitate toward low-cost providers, I maintain this story will continue to percolate. "Richard Curtin, director of the survey, somewhat ruefully noted that a mere one in 10 consumers polled reported an increase in income, the fewest recorded in data that stretch back to 1946." Let's look at the difference between the S&P 100 (big stocks) and the Russell microcap index. The S&P 100 continues to move higher. We have a clear pattern of lower lows (A) and lower highs (B). Also note the price EMA picture which is bullish -- all the EMAs are moving higher, the shorter EMAs are above the longer EMAs and prices are above all the EMAs. C.) Note the bearish orientation of the shorter EMAs -- the shorter EMAs are below the longer EMAs, prices are below all the EMAs and all the shorter EMAs are moving lower. In other words, big stocks have a bid and small stocks don't.